Point me to the dawgs! 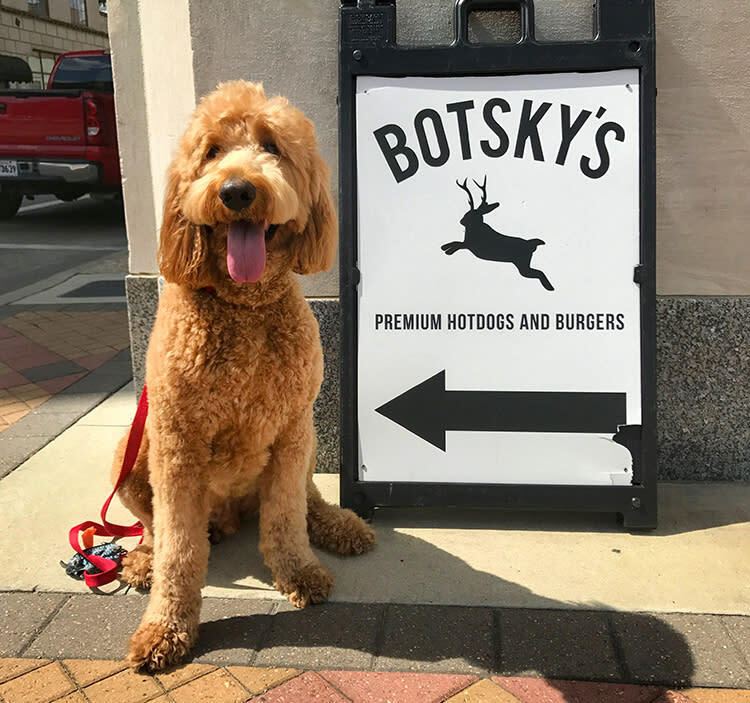 Botsky’s – Gourmet hotdogs with outlandish toppings (don’t worry pups, all of their menu items are canine-free!). This is a great go-to option for those that need to have a quick bite or for those that enjoy a Crying Eagle craft brew after a long day at work. ​Lunch in the Courtyard with Garden Path Groceries – This is a weekly pop-up restaurant that takes place every Wednesday from 11a.m. – 2p.m. in the courtyard at the Historic Calcasieu Marine National Bank. Offerings feature Southern vegetarian fare with worldly influence and inspiration, including fresh salads, quiche, soups, pastas, casseroles, Buddha bowls and more. The menu changes week-to-week, so check their Facebook page to see what’s cookin’ for your visit. Pujo St. Café – Their large, covered patio is a great place for a four course meal or just drinks with your pals. Located in downtown Lake Charles and serves American, Cajun and French cuisine. Be sure to check out their Sunday brunch! 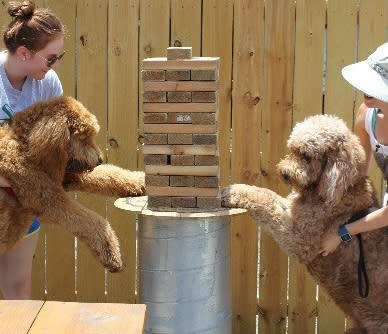 Rikenjaks Brewing Company – This restaurant has the largest pet-friendly patio in Southwest Louisiana! During my visit, I was promptly greeted by the friendly staff and a fresh bowl of water. 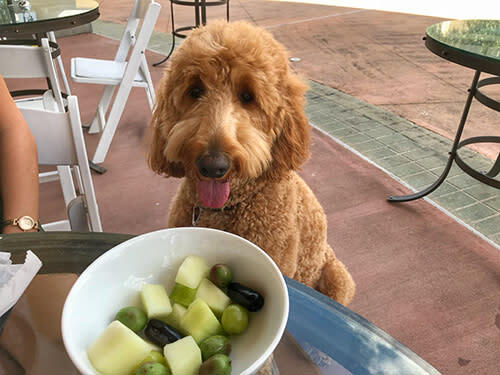 If you’re a good pup throughout the meal, your human may let you play some of the games in their courtyard. 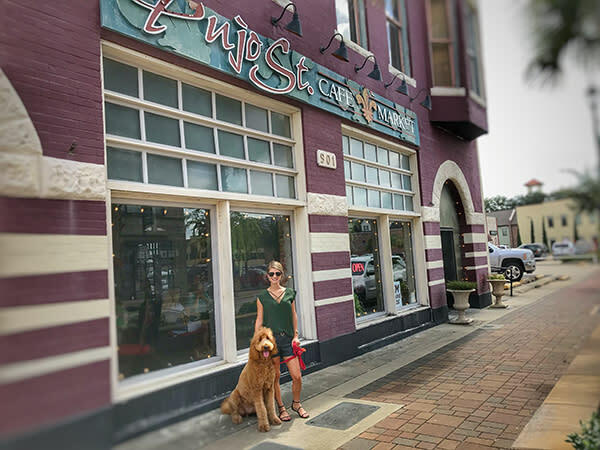 When you’re out & about at these dog-friendly locations, share your experiences with us by tagging your photos with #VisitLakeCharles! Do you have a dog-friendly eatery that you want to see Cooper visit or a favorite dish he should try? Let us know in the comments section below! Cooper is an 80lb. goldendoodle living the not so ruff life in Lake Charles, LA. He loves collecting sticks, chasing tennis balls, kayaking and taking long naps. Follow him on Instagram, @Cooper_Dood, to keep up with his adventures around Southwest Louisiana.